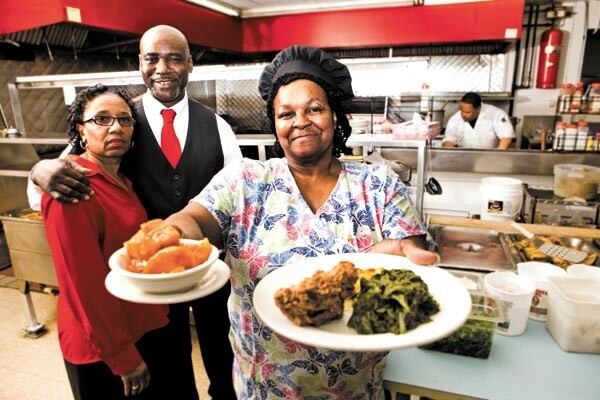 With Ruby's, a legendary west-side soul-food place is revived. Anyone who cares about restaurants should be very worried for the state of Chicago soul food. Recent years have seen an epidemic of disconnected numbers and papered windows, from legendary institutions like Soul Queen, Izola's, and, most recently, Army & Lou's to lesser-known but no less valuable third places like Doggy's S.S. Soul Eatery, P & P BBQ Soul Food, and Queen of the Sea. These shutterings happen in just the sort of neighborhoods that need independent, non-fast-food restaurants the most, and Chicagoans should take little comfort in learning that New York's soul-food establishments seem to be suffering even more. But there is one bright spot. In December, Garfield Park's legendary Edna's Restaurant—closed since August—reopened with pretty much everything except its late, beloved founder and her name on the sign. And it's just in time too, since Wednesday, March 9, marks the 45th anniversary of the day Edna Stewart and her father opened their doors. There was a time when every candidate seeking citywide office stumped through Edna's. But this year Rahm didn't show—and for that matter, neither did the so-called black consensus candidate Carol Moseley Braun, or Patricia Watkins, Gery Chico, or Miguel del Valle. Maybe that's because word hadn't gotten around that there was an operating restaurant here again. It's now called Ruby's, after all, for the new owner's late mother. But perennial candidate William "Dock" Walls knew about it. The Sunday morning before the election he was there pressing the flesh among the after-church crowd (not that it did him much good). On February 19, the first anniversary of Governor Quinn's state declaration of Edna Stewart Day, the place was mobbed with Stewart's friends and extended family. And last Tuesday it was packed well into the midafternoon with customers, leisurely lunching over the familiar airy yellow pancakes and sausage, the same crispy, batter-fried chicken, and what—as the sign used to say and has always generally been agreed—are "the best biscuits on earth." "It was always busy on the first of the month," says Henry Henderson, who along with his wife, Gloria, opened for business on December 19 with nearly all of Stewart's 15-member staff reporting for duty. Henderson is no outsider. He'd supplied Stewart with produce since 1989—she was his first customer. And after she was diagnosed with ovarian cancer in 2008, he'd occasionally discussed taking the restaurant over with Edna's longtime chef and manager Lillie Joiner if Stewart didn't make it. Joiner was hired almost 30 years ago by Stewart's uncle to work in the restaurant when it was located around the corner on Kedzie, and sometimes in Edna's Barbecue at Lake and Laramie (the family also owned a pizza joint, a laundromat, and a game room). By then its historic status as a refuge for Martin Luther King Jr. during the open-housing campaign was well established. When Joiner finally met the boss, "She scared me to death," she recalls. "I had never waitressed. After about two weeks I think I'm getting good, but everything I did was wrong. She was a perfectionist: 'You're gonna do it right or you're not gonna do it.'" Joiner waited tables for a decade before she began helping out in the kitchen. The first thing she learned to do was short ribs, following Stewart's exacting instructions. Eventually she took over the kitchen and the management, especially after Stewart got sick. After her death Joiner didn't expect the restaurant to close, since the family was so involved. Stewart's brother, Sam Mitchell, and his wife had helped out during her illness, and there was talk of Edna's daughter, Marguerite Banks, taking over remotely from Virginia, while Joiner continued to run things on-site. But the Mitchells were retired, and after a month the family decided long-distance restaurant ownership was too difficult and closed it down. Joiner took the time to relax and visit family—things she hadn't been able to do since Stewart got sick. "But after a couple months you get tired of doing nothing," she says. She mentioned her conversations with Henderson to the building's landlord, who called him up and asked if he'd be interested. Henderson was initially surprised. "It really didn't sink in," he says. Then "I thought about it—that this would be a great opportunity to keep this legacy alive. I could not let it pass as long as Lillie could be my manager, because I never ran a business like this. I need that help. Lillie agreed, and here we are." Sam Mitchell says the family was reluctant to give permission for Edna's name to be used—they weren't sure whether the reopened restaurant would meet her standards. So the Hendersons went ahead and changed the name on the sign, adding the motto "the finest soul food on earth." (The overhanging sign declaring the biscuits' preeminence was taken down and, sadly, thrown away.) They made a few other cosmetic changes, painting over the pink flowers on the walls and removing some booths to make way for more seating. Stewart's family members don't have reservations anymore. At the celebration on the 19th Mitchell presented Joiner with a plaque honoring her years of service, and the Hendersons with a certificate of appreciation for bringing the place back. "We're tremendously pleased," he says. Except for the addition of a few new menu items—chicken tenders and a turkey burger—the menu remains the same, down to the brains and eggs and the American cheese-based mac I'm convinced can't be touched by any other kitchen in the city. Joiner still comes in at 5 AM with veteran grill man Dwayne Fields, who's been there for 20 years. They turn on the stoves, put the beans on, and put the biscuits out to rise. "It's the same food," says Joiner. "I tell everyone I know this is Edna's. I cooked for 20 years and that's all I know. She taught me to cook it, so I have to do it the same way." But the collective memories of Stewart are so strong and numerous they contribute to a presence even more comforting than the food. "We talk about her so much she'll always be here," says Joiner. "If something happens in the kitchen we remember what she would say, and then someone's gonna say it. If you've been around a minute, you can feel her. She's in here. It's Edna. I don't care what anybody says, she's here."